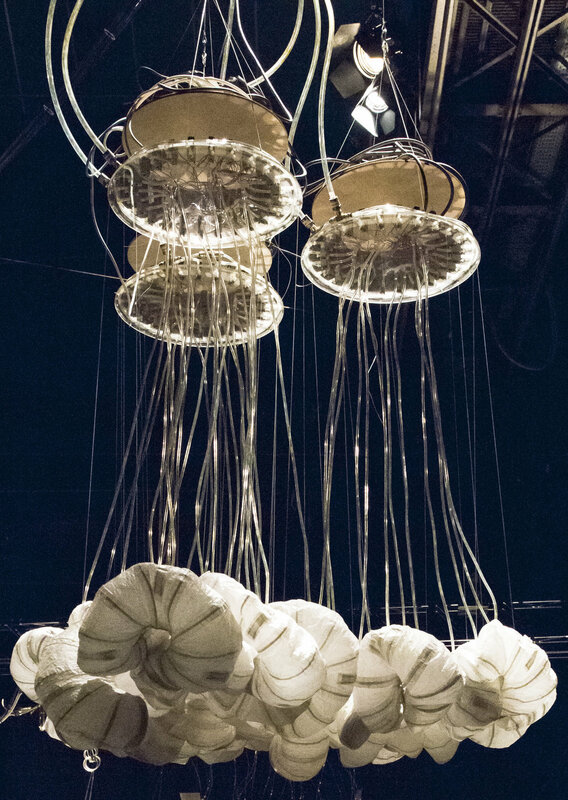 Suspended from the ceiling and arranged in the form of a cluster or cloud formation, Hexagons is an array of robotic muscles designed to explore new dimensions of expression of gesture. Its subtle movements, generated in randomized patterns by software, suggest the coming alive of organic matter. Each hexagonal unit consists of six sets of urchin-shaped robotic muscles that are connected into S-forms. The movement of each individual muscle has an effect on all of the others, creating ripples of cause and effect throughout the system. 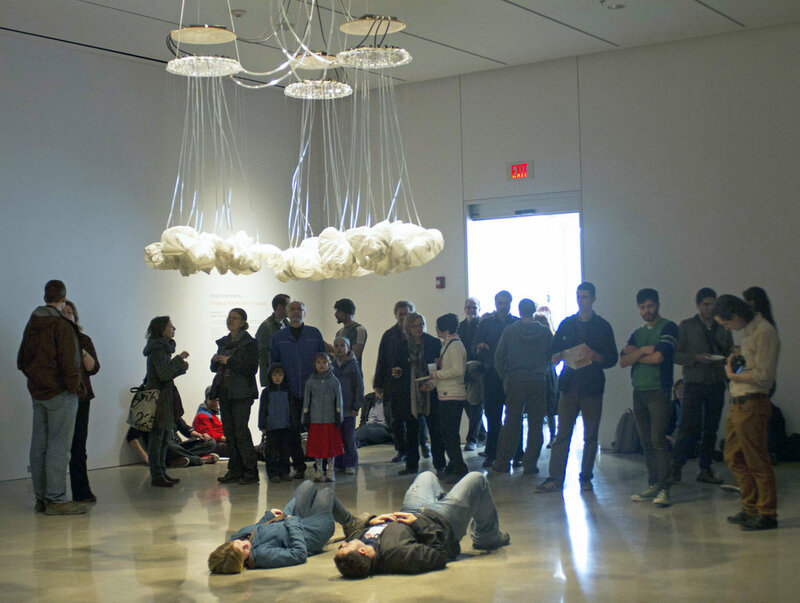 When a participant chooses to lie on the relaxation bed, they engage a process that the artist compares to the dance of molecules at the outset of cellular life. 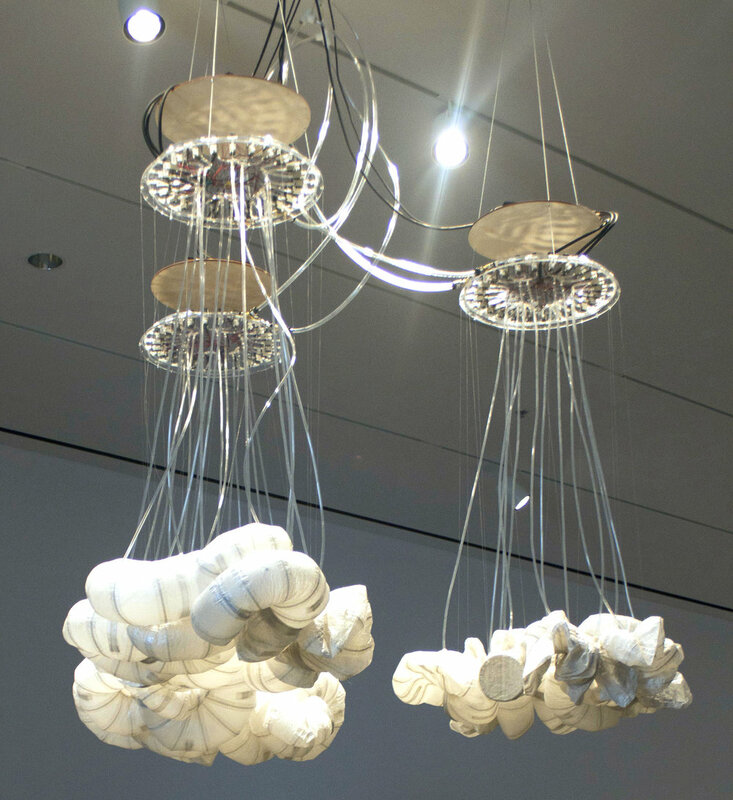 The process unfolds not only visually but also acoustically, with the clicking of electronic valves and the audible surges of air and vacuum that animate the forms. The effect is like peering into an enlarged Petri dish and watching a wild and ever-changing dance of nature infused with technology. This work ties together MacMurtrie's Inflatable Architecture series of the last 10 years, inspired by the geometrical building blocks of all organic forms. What sets this work apart is its physical relationship with viewers. It is designed to be experienced and enjoyed from a lying-down position, looking upward, in a state of relaxation. From this perspective, the slow movements and airflow through the Hexagons, like breathing, becomes a metaphor for the inner workings of our bodies and all life forms.